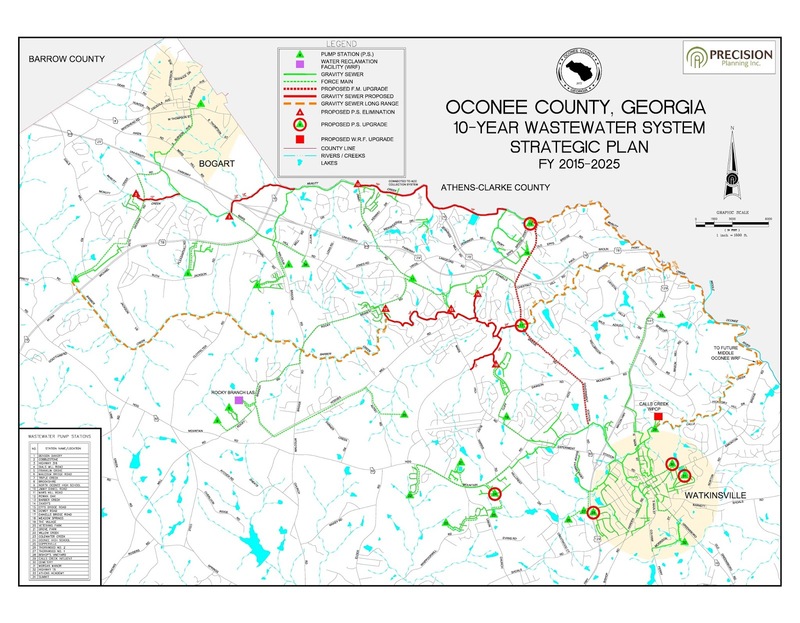 The sewer line along McNutt Creek as well as a separate project at Oconee Veterans Park are designed to bring more sewage to the county’s treatment facility on Calls Creek outside Watkinsville. The agenda does not include the proposed sewer pipeline down Calls Creek, but citizens will have the chance once again to express their views on that project at the front of the meeting or during discussion of the other projects, which are near the end of the BOC agenda. Haynie is asking for $27,835 for Precision Planning Inc., with offices in Monroe, for completion of plans and easement documents for the McNutt’s Creek Trunk Sewer from the Jimmy Daniell pump station to just inside SR Loop 10. The missing link will allow the county to gravity feed sewage from Bogart to the existing pump station at McNutt Creek and Epps Bridge Parkway, across from Kohl’s. From that point, the sewage will be pumped to the Calls Creek sewage treatment plant. The money Haynie is requesting will allow PPI to revise the design drawings based on final agreements reached between Oconee County and the golf course. PPI will prepare and submit a preliminary opinion of likely construction costs and prepare easement agreements for each parcel requiring an easement. PPI also will prepare bid plans and provide construction administration once the project is awarded for construction. 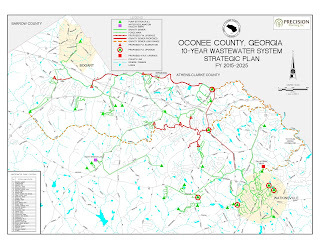 Haynie is requesting that the Board authorize spending $93,006 for general consulting services with Barge, Waggoner, Sumner & Cannon Inc., with offices in Peachtree Corners northeast of Atlanta, for a pump station to serve Oconee Veterans Park on Hog Mountain Road and the undeveloped Parkside project to the east of the park. At present, sewage from the park is pumped to the county’s Land Application System site on Rocky Branch Road, but that facility is operating at capacity. The plan had been for sewage from Parkside, now dormant, to go the LAS site as well. Under the new plans, sewage from the park and from Parkside will be diverted to the the Calls Creek wastewater treatment facility, the only other facility the county operates. The objective of this project is to provide an additional day of elevated storage of drinking water should drought management measures be implemented. The county currently has two towers on Mars Hill Road and one in Watkinsville. Implementation of the separate pressure zones will reduce the amounts of water lost through leakage as well as lessen the chance of breaks in weak spots in the system, according to documents Haynie submitted to the Commission. The Commission on Tuesday night also is to approve an actual amount for its contract with Precision Planning Inc. for security at the jail. It approved the project earlier this year but didn’t have an actual cost. That is to voted on Tuesday night. The agenda also includes a revision to the ethics code for commissioners that gives the special master additional power to gather information about complaints filed. The commissioners also are to get a third quarter fiscal year report from Finance Director Wes Geddings and an update on planning for the Fiscal Year 2016-2017. The line to veterans park is solely so the developers can start the rental units in park side. I'm sick and tired of tax payer funds being used to line developers pockets. Citizens should show up at the meetings and pressure the BOC to not approve these projects. If the Parkside developers wants sewer, they can darn well pay for it themselves!!! As best that I remember the developers of Parkside have already paid the sewer capacity fee when they were approved by the BOC. It is to be developed in stages and the commercial component about 70 acres has to be completed before most of the residential about 850 lots. When completed it will be the most massive MPD subdivision in the county. Assuming 1 1/2 children per house that could be an extra 1250 or so children added to the school system! Where will that sewer line run and what will it disturb? But the lights are on at the ball fields. Yes they paid fees but they come nowhere close to covering the financial burden placed on the county when developed. The average house in a subdivision doesn't pay enough in taxes to cover the services provided by the county.